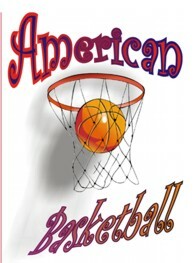 American Basketball is a statistical replay game on basketball, that aims to cover most of the leagues concerning basketball, both male and female, in the USA. We have chosen a simple approach, making for a really fast simulation of a single match, ideal for completing a season in only a few hours of play. There is a basic version and an advanced version, that adds a few modifiers, at a cost of a few more dice-rolls and a little more time for each match.